(April 1, 1894, 124 years ago): The Montpelier Liberal United Brethren Church was dedicated. The Montpelier United Brethren in Christ congregation was reportedly organized in the 1830s. If so, the congregation predates the village of Montpelier, which was surveyed in 1845. Circa 1853, the congregation erected a house of worship on the west side of Jonesville Street, between Jefferson and Ohio streets. In 1889, the United Brethren denomination nationally split into so-called “radical” and “liberal” factions over the issue of membership in secret societies such as the Masons. In February 1893, the Radical United Brethren (now known as Central United Brethren) congregation dedicated a house of worship on the northwest corner of Lawrence and Broad streets. 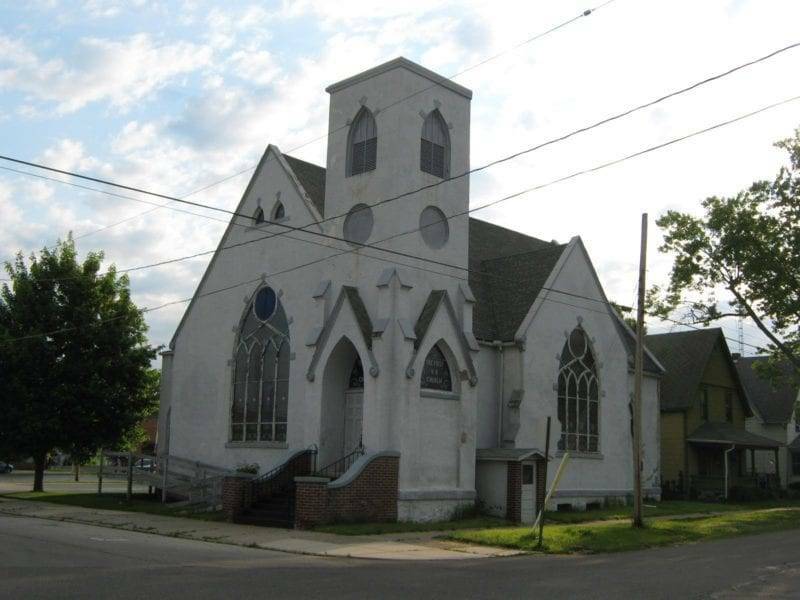 On April 1, 1894, the Liberal United Brethren (now known as First United Methodist) congregation dedicated this brick house of worship on the northeast corner of Empire and Jefferson streets. The historic brick structure served the First Church of the Nazarene congregation from approximately 1963 to 1994 and the House of Prayer from approximately 1994 to 2009. This May 21, 2016 photograph of the former Montpelier First United Brethren Church is from the Kevin Maynard collection–Courtesy of the Williams County, Ohio, Local History Exchange. Be the first to comment on "(1894) – Montpelier Liberal United Brethren Church Dedicated (Montpelier, Ohio)"